I rang in the new year with a household of germy humans. We took turns sharing flu symptoms. I must admit it was not the ideal ending to the winter break, but I was able to get a few things done around the house as I was confined within it. Today I wanted to share with you a Flip Through of last year’s bullet journal. In 2018, I set a goal to maintain a regular schedule in my bujo and I’m happy to say that apart from some short setbacks I was able to complete the journal. I’m really pleased with many of the pages and I’ve learned some techniques that I plan to incorporate into my 2019 bullet journal. Which spread is your favorite? These are some of the projects and ideas that I’ve been pinning lately on Pinterest. Follow me! I love to share new ideas and take inspiration from others. This will be a great year full of creative work and organization. I have a creative mind. I love to read, write, and even to doodle from time to time. Creating is the way I express my thoughts and feelings. There’s nothing better for my soul after a long day than to sit down at the table and write. I may choose to write about my day. I may choose to write a silly story. Sometimes I even dabble in poetry. It’s all about how I’m feeling and the way my mind processes the world at that time. I’m not alone when it comes to possessing a creative nature. All of us are creative in some way or another. To create means to give life and each and every one of us has a desire to give life to thoughts, ideas, dreams, and more. We were all created in the likeness of the Father, who by definition is the First Creator. Therefore, within each of us is the desire to also create. Creating is more than arts and crafts. Creating can be designing, building, dreaming, etc. Creating is life giving. We all need to remember that our souls long for time to create. Take a few minutes today and create something. Draw a picture. Write a song. Build a shelf. Tend your garden. Do whatever creative act brings you joy. One of my favorite blogs which I follow is by Rachel Wojo. She is a creative and inspiring person who posts about her faith and journey through God’s Word. Lately, Pintrest and Rachel’s blog have been capturing my interests with this new phenomenon in Bible study methods. Essentially Bible Journaling is an illustrative approach to memorizing or dwelling on scripture.With this practice you turn your Bible into a visual scrapbook of your faith. You can journal within the margins of any Bible, but the exercise has become so popular that many Christian publishers now offer Journal Bibles. After a few months teetering on the edge of the practice and attempting to journal within the margins of my NIV study Bible, I think I am ready to take the plunge. I would like to purchase a Journal Bible. I’m reaching out to my community for help. Journal Bibles are a large market. Not only are there different publishers, but there various translations, styles, and font sizes to choose from. I want to find a Journal Bible that is affordable, but that will also last. I’d like the pages to be thicker than a standard Bible and plenty of space to write and draw. There are so many choices that I’m completely overwhelmed. This Valentine’s Day I received a copy of Margaret Feinberg’s Live Loved: An Adult Coloring Book. This book is so much more than a booklet of motor skill refining pictures. Rather this book is a walk through some of the most intimate scriptures which highlight God’s love for His people. Some people (like me) are wired with creative tendencies. For those of us who enjoy artistic expression we need to make sure we find creative outlets for those personality traits. It’s easy to get busy and to keep from expressing ourselves as artists, but it is imperative to spend time rewinding in a creative activity. This book is really a cutting-edge idea. I journal and write about what I am learning in my journey through God’s Word, but I’ve never put much thought into reflecting on what I read in a more creative way. The whole idea behind this book is to spend extended amounts of time creating, praying, memorizing and reflecting on passages from God’s Word. Over the next several months I intend to begin Bible Journaling. (If you are unfamiliar with what all that entails check out this post by Rachel Wojo.) Working my way through this book, however, is a great segue to that process. I will openly admit that while my mind may be wired in a creative manner that my abilities may not be top-of-the-line. As I work my way through this book I plan to share with you some of my pages and reflections. So, please, no judging the artwork. Today, I read and reflected on 1 John 3:1. After completing my illustrative page I turned my attention to God’s Word. I was led to a passage in the following chapter (1 John 4:16-18) which also focuses on God’s love and what that means. Today, my prayer is that I begin to live a life more focused on the fact that I am loved by my God. That in doing so I may experience love without fear. That I might accept the only love which makes me complete through seeing myself as lovable is my prayer. Lastly, I pray that God’s love spills over into the way that I love others around me. Welcome to my very own Creative Writing Month where each day of the month I am focusing on a topic and spending fifteen minutes reflecting and writing as inspired by the topic. For more information about why and how check out my post, Writing Down the Bones. Today’s topic: Pick a color. Take a walk and notice all the things that color and write about it. The color navy blue has captured my attention lately. The halls in the school where I teach are lined with navy lockers. Floors of navy and gold tiles line the pathways from each classroom down never ending corridors. My wardrobe today is reflecting my adoration for the color as my camisole and trousers match the array. Students pass me as I journey the campus all adorned in their navy and gold regalia. 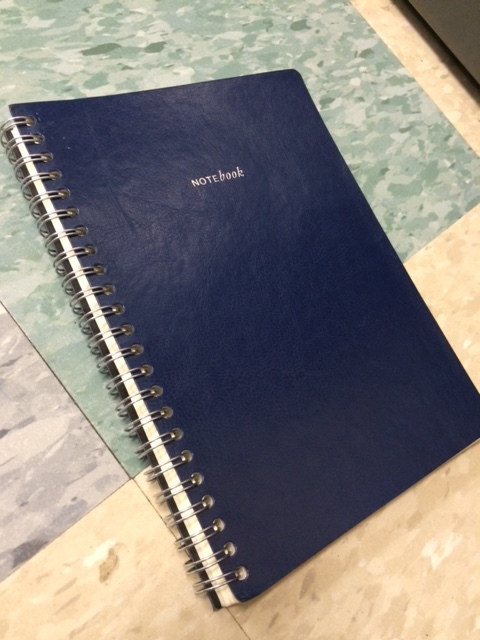 But of all things navy blue in my close quarters today I must discourse about my notebook. My notebook. My lifeblood. Where my thoughts go to live. It is rare to find me in a place without this notebook. A phone with a notebook app will never quench my insatiable desire to put pen to paper and really bleed onto a page. My notebook contains thoughts, prayers, quotes, stories, and ideas for my writing. When given the luxury of a few moments alone I turn to the navy blue, leather-bound, spiral vault of ideas. This small book embodies the restlessness of my mind. To an outsider this book may seem like a jumbled mess, but to me it is my life. The things I ponder and those I cherish are all contained herein. So although my eye was met today with a variety of navy blue objects I am drawn most of all to the smallest of those objects which I store in my large navy and green purse: my Writer’s Notebook.